There's way much more thought and coordination that goes on in preparing a River Tay salmon fishing hospitality day than most people would imagine. 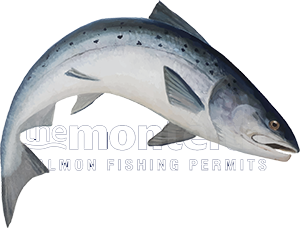 Getting everything just right and over worrying every fine detail is the only approached for a perfectly delivered salmon fishing event day. Although I've arranged salmon fishing events on many Scottish rivers I always promote the Tay as she not only commands a centralised logistical position in Scotland but she always has enough water for salmon to move even during the 'lowest of low' water levels. When a salmon fishing event guest is paying top dollar for the best guides and riverbank hospitality there needs to always be a genuine chance of salmon action so the Tay always provides that due to her huge loch fed catchment size. The Tay is completely blessed with the finest professional salmon guides and the majority of whom are true ambassadors for their own individual salmon beats and the river in general. Real talent in operating the traditional Tay coble boat or with fly or spinning rod in the hands of these guys is no way thin on the ground and many professional Tay men are also amazing sources of salmon fishing information. On a salmon fishing hospitality event day over and above the basic Tay salmon guide brilliance it requires another level of polished skill level and that is being able to switch into a top notch client riverbank host in addition to having the ability to be able to pull the 'rabbit out of the hat' in testing water conditions. When choosing a salmon fishing venue I've always favoured the middle river Tay area as generally there's always fish to be caught and there's usually always salmon beat availability for an 'exclusive use' salmon beat let which is obviously required for any River Tay salmon fishing event. Over the years I've been arranging hospitality salmon fishing events for guests I've seen some truly amazing fishing hut transformations take place where the regular look of the fishing hut changes into a high end London restaurant! On the Tay there's a multitude of luxury salmon fishing huts which make this transformation task an even easier one than normal. The huge Tay Valley also provides a fantastic range of quality accommodation choices for fishing guests that separates it apart from many other Scottish salmon rivers. Over the years I've had various catering organisations come in and prepare salmon fishing lunches and on one instance an entire hotel that was positioned close the the Tay was taken over to feed a party of 50 Russian salmon fishing guests who'd been fishing that morning on 5 beats of the Tay with 15 professional Tay ghillies! That is however an extreme example of the size of the normal salmon fishing event day and the average party usually ranges from 6 to 10 guests which is a far easier to professionally cater for. My favourite chef and colleague for entrusting a salmon fishing event lunches to is Jeremy Wares who's a truly brilliant 'Michelin starred' Perth based chef who never fails to amaze with his culinary brilliance. The day before a salmon fishing event always bring a check list of things to be done which can range from polishing fishing hut windows to a general fishing hut area tidy up with the strimmer. Checking equipment and building up both fly & spinning rods along with making sure all the correct wader & jacket sizes are pre picked in accordance to the guest's names list are only a few of the normal tasks to get everything just right. Arriving early on the fishing day and having the boat engines on 'tick over' and lighting the fire if it's a cool morning are again just minor details that make all the difference to the guest's salmon fishing event experience and should never be underestimated as it the 'attention to detail' that keeps you on the top of the tree with customer service levels.